You might be seeing plastic eggs, pastel candy baskets and chocolate bunnies, and it can only mean one thing: It's that time of year again. If you're looking for things to do for Easter, here are some ideas for you and your family. Easter Monday at the National Zoo: Celebrate Easter Monday at the National Zoo (3001 Connecticut Ave. NW), where you'll find activities throughout the day, including Easter egg hunts with prizes, field games, special animal demonstrations and live entertainment. Don't miss out on the chance to meet the Easter Panda as well! The event runs from 10 a.m. to 2 p.m. Due to the increase in visits expected due to many schools' spring break, expect longer lines due to increased security screening. Eggstravaganza D.C.: The National Community Church is hosting an "eggtravagant" egg hunt at Lincoln Park (East Capitol Street NE) in Capitol Hill. The massive hunt will be Saturday from noon to 3 p.m. Bring your own basket or use one of their complimentary goodie bags. You'll also find a photo booth, an Easter bunny for photo ops, snacks, games, raffles, face painting and more. Best of all, the event is completely free. If you're more of an early bird, consider the egg hunt in Langdon Park (2901 20th St. NE) from 10 a.m. to noon instead. Washington Nationals Easter Egg Hunt: Go hunt in the outfield following the Nats vs. Phillies game on Easter Sunday. 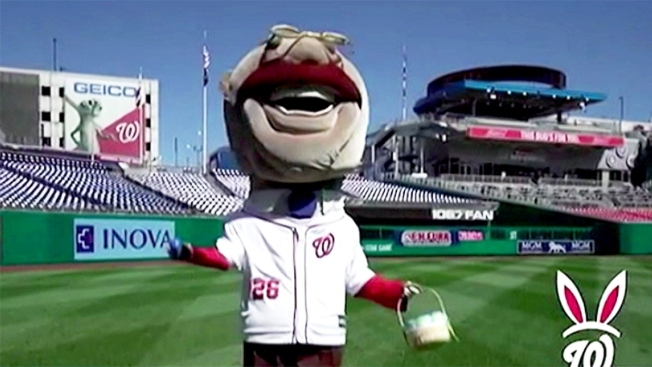 Kids will be able to take home a commemorative Nationals Easter egg and basket. Nationals items such as jerseys, autographed items and baseballs will be hidden in a few "special" eggs for children to find. A special game ticket ($30) is required to participate in the event, which will happen at Nationals Park (1500 S. Capitol St. SE) right after the Kids Run the Bases event. Bunnyland: Butler's Orchard will host a rubber duck derby, pedal tractors to ride, hayrides, face painting, an egg hunt, pony rides, giant slides, bunnies and more. Festivities are happening at Butler's Orchard (22222 Davis Mill Road, Germantown) Friday, Saturday and Monday, and again April 21-23. The farm will be open from 10 a.m. to 5 p.m each day; admission is about $9 for kids and $7 for adults. Note that Bunnyland will be closed on Easter Sunday. Bunny Train Ride:Walkersville Southern Railroad (34 W Pennsylvania Ave., Walkersville) will offer a bunny train ride on the Pennsylvania Railroad's track, built in 1872. Visit the turn-of-the-century railroad station and tool house and then visit with the bunny on the train, who will give each child an Easter gift. The vintage 1920s passenger cars or open flatcars will run through Maryland's farm country and end the trip with juice and cookies in the museum after the ride. Reservations are required. Hampton National Historic Site: If you're looking for a road trip, head out to Hampton National Historic Site (535 Hampton Lane, Towson) for an Easter egg scavenger hunt through the beautiful landscape of the grounds. Kids of all ages can join the egg hunting and will receive candy to take home. Areas of the grounds will be divided up according to age groups. The hunt will begin at 1 p.m.; candy distribution will begin at 1:45 p.m. Public-assisted cleanup will begin at 2:30 p.m. Admission and parking at the site are free. 18th Annual Easter Egg Hunt at Lee-Fendall House:From Friday through Easter Sunday, the Lee-Fendall House Museum & Garden (614 Oronoco St., Alexandria) will hold its 18th annual Easter Egg hunt, with hundreds of colorful, toy-filled Easter eggs. You'll also find activities such as crafts, photo opportunities with the Easter Bunny and snacks. The event is open to kids ages 10 and younger, along with their families. The egg hunts begin Friday at 3 p.m., Saturday at 10:30 a.m., 12:30 p.m. and 2:30 p.m., and Sunday at 12:30 p.m. and 2:30 p.m. Tickets are $12 for kids 10 and younger, $5 for adults, and free for Friends of Lee-Fendall House; they're available online. Spring Festival at Ticonderoga: Every Saturday and Sunday until April 23, you can participate in Spring Fest at Ticonderoga Farms in Chantilly, Virginia (26469 Ticonderoga Road). You can see the Easter bunny and join the egg hunt to try to find a special golden goose egg for a prize! The hunt will be from 11 a.m. to 2 p.m., divided into three hunts by age. You're asked to arrive at least 30 minutes early to ensure you don't miss out. You'll also find huge pillows to jump on, hayrides and animal feeding. Tickets on weekends are $14.95 for everyone 2 years old and up. If you go on a weekday, admission is $10.95. The farm is open from 10 a.m. to 5 p.m. daily, but gates close at 4 p.m., so don't be late.